Beware the Were-Chickens of Beesdone! Uncle Rogipoos and Jose survey their new premises! A few weeks ago Tony Harwood asked me to do him a little favour. What is it you ask! To send on a gift to Roger Willcox, or as he is better known to the Notables Yahoo Group ‘Uncle Rogipoos’. I was delighted to do this for Roger as he is a very entertaining and stand up fellow who often makes me laugh with his crazy tales of adventure on the group. Also to help out Tony who is a very talented modeller and fan of Flintloque. Above you can see the item which was the gift. The coop of the Were-Chickens of Beesdone. I could not resist having a look and taking some pictures. 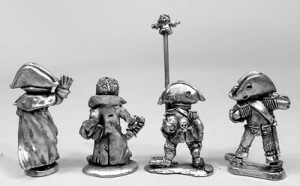 This image shows the coop along with Uncle Rogipoos and his pet Armadillo Jose, two miniatures from the VLE10 set based on Roger’s characters. I can say that Roger got the gift in perfect time for Halloween as Tony asked me. He did open it a day early and I accept the blame for this as a recent bad head cold made me forget to email Roger and tell him not to open it to the 31st! But hey ho. I know Tony is planning a book on his wonderful terrain, perhaps the coop will feature in it. 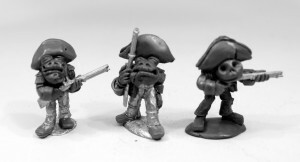 Carrying on from the first part of this posting about the 777th Croaked Line for Flintloque and Alternative Armies I present to you all the end result of the molding process. 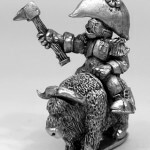 White Metal miniatures! 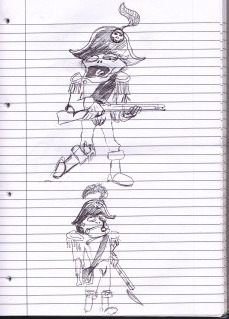 Below you can see all of the poses in this brand new regiment both front and back views. Going from the top we can see all of the white metal loveliness. These are ‘tins’ that is master mold castings which are then used to make the production molds which will make all of the miniatures which will go out to Flintloque players all over the world. These are brilliant miniatures filled with character and inspiring a lot of adoration even at this point. 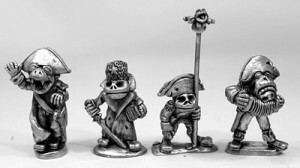 Being an Undead formation the unit code for these miniatures will be twenty eight figures strong which will be released alongside a pack of all the poses and a couple of blister codes for trooper boosters and extra dead Todoroni. So far reaction to my asking has been that the casualty should be in the core pack but not in the unit code. This might change. I know Todoroni players will want a pack of corpses for their mortal troops demise on table. I am going to save naming these miniatures and character ideas until I see them painted up and complete which brings me onto the next part of this series of wee articles. Rob Alderman is busily painting up his own set of the 777th Croaked Line in a uniform of his choice…but…Eve Hallow is also painting up a set of the same with his own idea of the uniform. My plan? To bring you both versions! As this is a brand new Undead unit there is a lot of leeway with uniform choices and flesh tones. Rumour has it that Rob has gone for a variation on the Bella Lugosi Militia uniform and Eve has riffed on the historical uniform of ‘Kingdom of Naples’ line infantry. We will see what is what soon enough. I will be impartial and intend to studio photograph both sets…perhaps a vote on the Notables Yahoo Group to chose which uniform becomes the one for the official website page. Until the flesh rots people…. 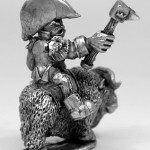 Since I began this blog I have been asked to give an account of a new set of Flintloque miniatures from their deepest origins through concept to greens to white metal and release. This process often takes six months if not near a year in some cases so it is only now that a project has come along that I have been able to detail in such a manner. Interested? 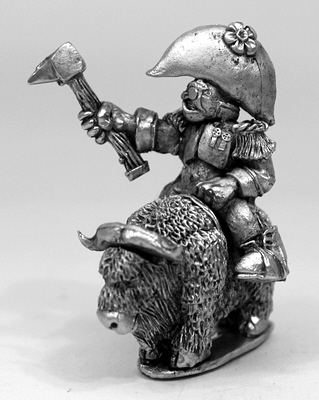 Well you should be for this is the stuff of miniature making magic! 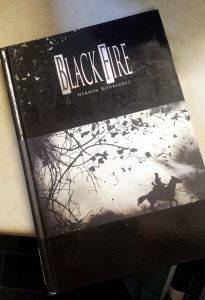 Back when Flintloque 3rd Edition 5026 Death in the Snow was published in 2010 the realm of the Witchlands was greatly expanded and among those expansions were more troop types and unit profiles. 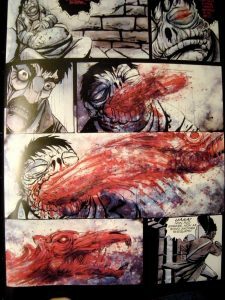 In the months that followed the feedback from the new book was really good and one of the most talked about subjects was ‘Undead Todoroni’. 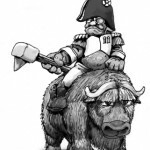 After all had the Todoroni of Nepolise not come a long way since the late 1990’s, from a unit of militia to a whole army in their own right with cavalry, artillery and more? 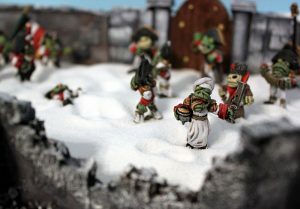 With that army in the Witchlands it stood to reason that there must be re-animated Zombie Toads! I had come to this conclusion on my own and as a result I squeezed in a mention of the ‘777th Croaked Line’ in the army structure of the Dark Czar. This mention caught players attention and led me to a conversation with miniature designer and Toad Mad man Rob Alderman in May this year. As you can see above we came to an agreement over what a potential set of 28mm white metal Undead Todoroni would look like. Rob’s sketches along with his own and my own input worked out a concept and then a design tender that would meet the needs of fan’s of the shambling dead. Over the course of a week we batted it back and forth, consulted mortal Todoroni uniforms and other Undead formations and agreed on a total of nine greens to be created. 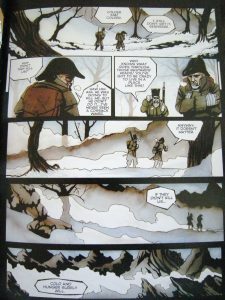 This took Rob about ten weeks among his other tasks as a designer and working man (he is a busy chap!) with a couple of checks of progress and some images to finalise creative direction. Once carefully package Rob sent the greens to me at Alternative Armies where they arrived in late August. You can see them below! 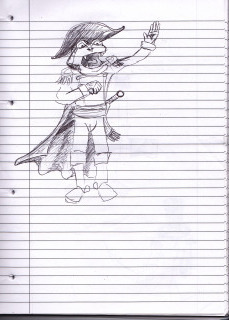 As you can see Rob followed the initial sketches and expanded on them too. My own input kept his sanity hat screwed on tight and we worked out that in doing a full (and with nine greens it is a full unit) set we would need to provide not only troopers but also the command and the always found Witchlands requirements of a Vampyre and a Liche. Since no Undead Todoroni exist in the Flintloque range they would also be ‘firsts’. Details discussed included the style of dress and demenour of a Todoroni Vampyre (slick and slightly camp as it turned out), if a Zombie Todoroni cannot sing like normal Todoroni then what is the unit musician doing (playing an accordian of course! ), the standard bearers flag pole topper (a homage to Mad Queen Maria’s glove puppet Mr Froggy). 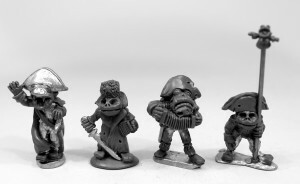 As well as those we decided to vary the level of decay in the troopers (as in the rules of 5026) and to avoid bayonets as many gamers now prefer their muskets bare. 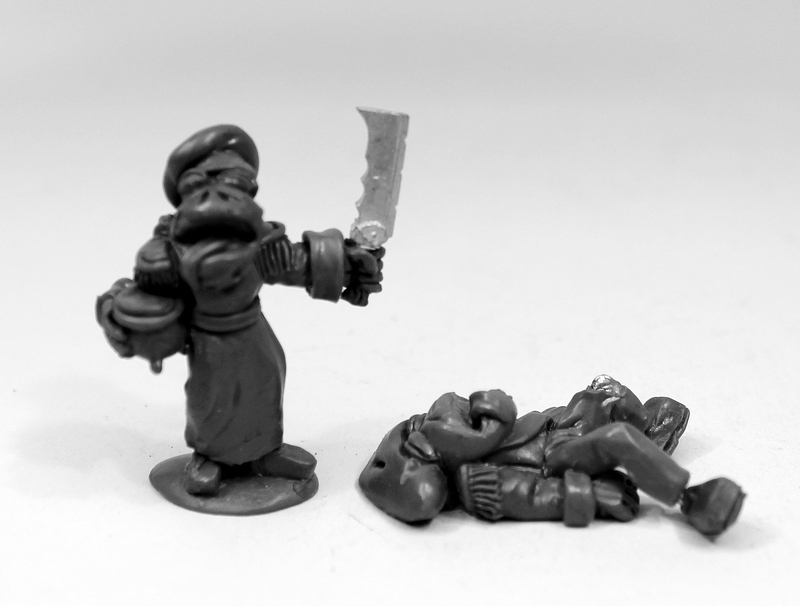 Late on in the process we decided to drop the fourth trooper and replace it with a unique and new miniature for the Undead…a Zombie Todoroni Chef! Why..well humour of course, it is Flintloque’s goal. The last addition was a dead Todoroni. 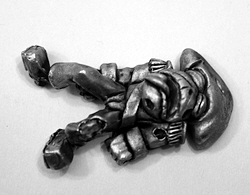 This figure has several purposes in that it could be a dead mortal Toad (battlefield marker) or a corpse ready for re-animation or such. 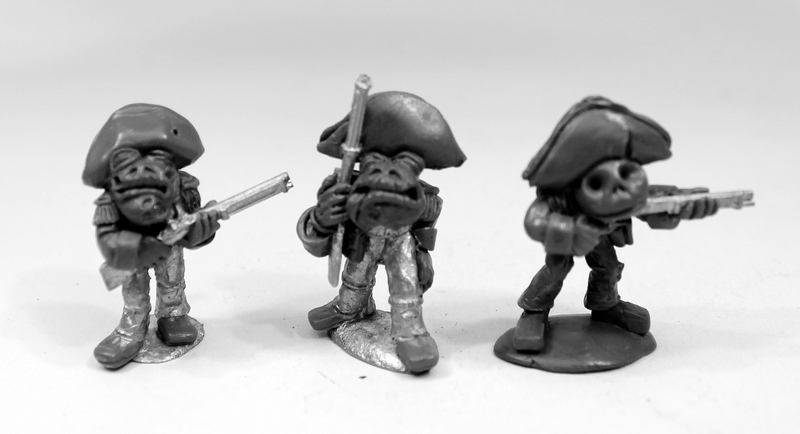 So that is it for the initial stages of this new set of miniatures. Any questions just post below or email me direct. This is the first of several postings on the ‘777th Croaked Line’ and in the next one I will be detailing the master molding stage and white metal ‘tins’ along with an account of each pose. Win the Pin by Creating a Character this Weekend! This week I made a posting here about my Flintloque pin badge which I wore for years at demo games all over the world back in the 1990’s. There has been a lot of interest from members of the Notables Yahoo Group in my offer to let someone win it and I would post it to them. So after asking for suggestions how to go about choosing a winner the method suggested by Chris Pryme was chosen and that is for me to note down the email addresses of every Notable who makes a posting between Friday 3rd and Monday 6th August HERE. I will then randomly select the winner and contact them to ship them the pin. But what Flintloque related subject should be discussed by Notables to get their postings on the group for a chance to win. While a message on ANY Flintloque or Slaugherloo subject will be entered I want to make it a little more interesting so I offer a second competition within the first! I want the Notables to suggest a character profile for an as yet unreleased Flintloque miniature! Above you can see artwork of the miniature and below an image of an assembled master casting in white metal. 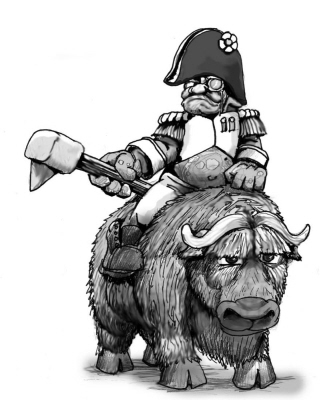 The miniature is a high ranking Trolkin Officer mounted on a Muskox. 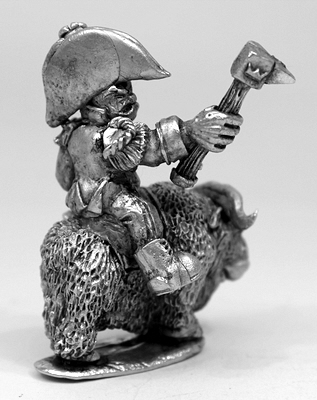 The prize in this second competition is the miniature in question worth about 8.00GBP and not to be released for several weeks yet. The terms are that you need to post a message on the Notables Yahoo Group between 3rd and 6th August telling me who this character is, his story, an idea of his Flintloque and or Slaughterloo profiles in play. I will get you started with his name ‘Colonel Skand Stoyne‘. About two hundred words will be fine. It does not have to be super accurate or points based as I will choose a winner and assist in finalising the text and so on for release of the miniature. You can read the Notables Message on this competition HERE. 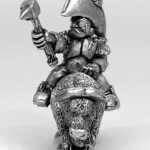 So you have the chance not only to win an unreleased miniature but also to name it and in the process the chance to also win my personal pin badge! Excellent! Get over to the Notables and post your idea!